I remember as a child, fascinated by all things non-human, collecting garden snails in my little glass terrarium. I would throw in a bunch of lettuce leaves and spend hours watching the snails glide around the slime-streaked glass, with their strange eye-stalks contracting and extending like a cheerleader’s arms in slow motion. Occasionally, I would stick my finger out and tentatively touch an eye – and jump ever so slightly when the eye disappeared into the snail’s gelatinous head. What had prompted the snail to retract its eye? Was it afraid of me, or had I possibly hurt it? Might I have threatened our burgeoning friendship? What was it thinking? To this day, as an adult, I am still fascinated by animal behaviour, cognition and consciousness. What I had never considered, however, and what struck me this morning while I scanned Science Daily’s “Behavioural” section, was that behaviour isn't limited to the animal kingdom. I read, with my mouth slightly ajar, about a unicellular protist that displayed evidence of habituation – an unmistakable, if rudimentary, form of learning. The original paper was published just a couple of days ago in Proceedings of the Royal Society of London B. Boisseau et al. (2016) barred the slime mould cells’ passage to a food source with a bitter, but unharmful substance, and showed that, while initially hesitant to move through the threatening substance, they moved with increasing speed after “realising” that the substance was harmless. Within six days, they were behaving in the same way as the control group. Two days after removing the chemical obstacle, the cells once again became “distrustful” of the substance. I had to know more. A cursory search of the recent literature was edifying – this particular species has been shown to optimise its nutrition when given the choice (Dussutour et al. 2010) and solve mazes (Nakagaki et al. 2010) using Hansel and Gretel’s bread crumb approach (substitute bread crumbs with a trail of slime). They also form complex, interconnected networks of slime between food sources which allow them to move between these sources at maximum efficiency – to the point that researchers are suggesting they be utilised in the future planning of transport systems (Adamatzky et al. 2016). This particular species has also been shown to foresee predictable changes in its environment, and prepare for them physiologically in order to prevent unnecessary energy expenditure (Saigusa et al. 2008). Incredible. And here I sit in the office in winter, shivering and expending way too much energy because I once again forgot my jersey at home. Perhaps it’s time we stop considering intelligence to be synonymous with a nervous system. If a single-celled Protist can accomplish so much, I imagine that certain highly complex, multicellular, but seemingly behaviour-less organisms might hold a wealth of secrets hidden away from the observer’s keen eye. After everything I've read today, I think it’s high time I explored the hitherto unknown (by me, anyway) field of plant behaviour.. Stay posted. Boisseau RP, Vogel D, Dussutour A. 2016. 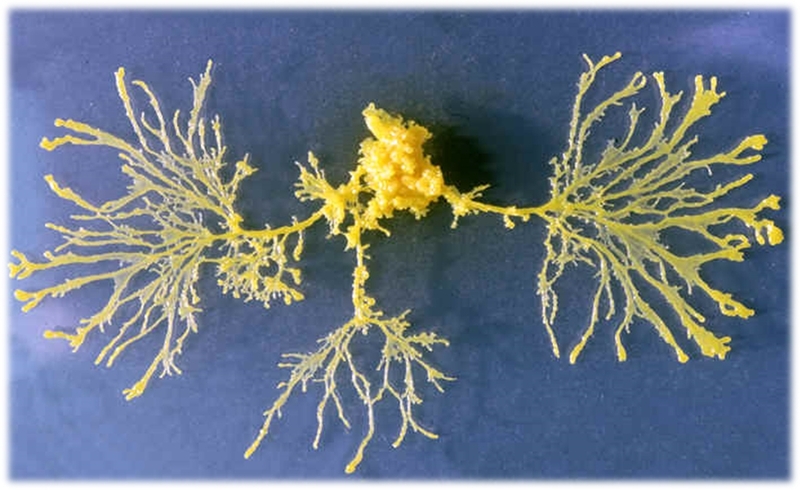 Habituation in non-neural organisms: evidence from slime moulds. Proceedings of the Royal Society of London B 283: DOI: 10.1098/rspb.2016.0446. Dussutour A, Latty T, Beekman M, and Simpson SJ. 2010. Amoeboid organism solves complex nutritional challenges. Proceedings of the National Academy of Sciences 107:4607- 4611. Nakagaki T, Yamada H, Tóth A. 2000. Intelligence: Maze-solving by an amoeboid organism. Nature 407:470. Saigusa T, Tero A, Nakagaki T, Kuramoto Y. 2008. Amoebae anticipate periodic events. Physical Review Letters 100(1):018101.